YouTube marketing can mean many things — it could be creating videos to promote your business, or product demonstrations for potential clients, or even instructionals for customers who already bought your product. There are many ways to leverage video content to help your business, but there is one important thing to remember about YouTube: every video is on equal footing. There are channels that feature “premium” content, but each individual video sits on its own YouTube page, whether it was produced by a multi-million dollar ad agency or a small mom-and-pop store. One area where this has become an extreme example is the beauty industry. 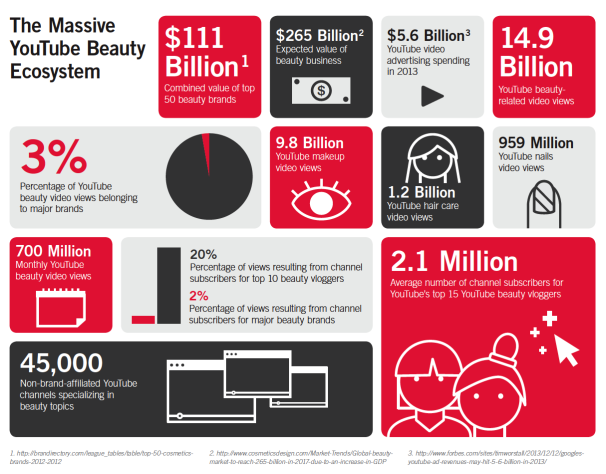 The beauty and cosmetics industry is big business: over $13 billion in annual revenue. And we’ve all seen their ads on television — beautiful young people pouting at the camera in dramatic light. Or fifty-something Hollywood stars who don’t look a day over thirty. That’s the kind of brand recognition that a huge ad budget can buy. But what about online? In this report from the website Pixability, we can see the impact that smaller players are having on the beauty industry. While the big-name brands all have channels on YouTube, they’re completely overwhelmed by smaller players and individual vloggers who have seized control of the conversation. As you can see, there are 45,000 channels that focus on beauty-related topics. That’s a lot of video being dedicated to one industry. Yet only 2% of the 700 million monthly views are going to the big players in the industry. To take it a step further, the top 15 beauty vloggers have over 2 million subscribers! What does all of this mean to the big players in the beauty industry? The most important thing it signals is that in an industry where image control is crucial, they have no control at all. Even if they were to ramp up their YouTube marketing efforts dramatically, there’s almost no way they could stem the tide of information about their products being put out there by third parties. If you’re a business in central New Jersey looking to put some videos online, you may not think this has much to do with you. After all, if you had millions of customers critiquing your product on YouTube, you’d have millions of customers. Nice problem to have. But the issues facing the big players in the beauty industry can be instructive to any business. If you are not controlling the flow of information about your product online, someone else may. That someone may be your biggest fan, or your biggest competitor. Smart YouTube marketing means taking the initiative and putting your best foot forward, so that anyone who is searching for your product or service is likely to find a message that you’ve crafted, and that serves your goals. TeeFour Productions can help your New Jersey business with your video production needs. Don’t let your message on YouTube be delivered by someone else, get in touch with us and take charge of your YouTube marketing! Video sharing on social media can take many forms. Once you’ve created your video, you have options on where and when they can be played. TeeFour Productions has experience in using most of the popular sites and we’ve developed a strategy to help your video get maximum exposure. You have a lot of choices about where to host your video. You may host it directly on your server, tightly integrated with your website. There are some advantages to this approach. Mainly, it gives you a clearer picture of analytics as far as how many people view the page and actually play the video. There are also many third-party sites that will handle your videos for you. WordPress, for instance, has a subscription service that serves video and works very well with their popular backend. For pure critical mass, however, the clear winner is YouTube. As you can see from this poll report about video sharing on social media from the site ReelSEO.com, the vast majority of video producers choose to host their videos on YouTube. There are a lot of reasons for this. The biggest one is that YouTube is, well, the biggest one. YouTube is now the world’s second most popular search engine, behind only its parent Google. It just makes sense to be where the eyeballs are. But YouTube doesn’t just rest on their traffic. They also provide a great many tools to optimize your video marketing efforts. One of the biggest advantages to using YouTube is its portability. On virtually any platform or device, the reader will recognize that a video is originating from YouTube and either embed the player or launch a separate app. This is very important. The only thing worse than customers not being able to see a video that you paid to produce is frustrating your customers because they can’t see your video. Another great feature in YouTube is the Closed Captioning option. This might seem like an extra feature that doesn’t benefit many viewers, but in fact it is an essential part of search engine optimization. By giving a clear and definitive transcript of your video, Google is able to index its contents just as they do your website. So now you’ve got your video, hosted on YouTube with a transcript, what next? This is where your wider social media presence becomes important. Rather than hosting a video on Facebook, you can post your YouTube video directly on to your Facebook page. This is rather seamless to the viewer, but maintains your one central area to track views. Then you can extend your efforts to Twitter, Pinterest, or whatever other platforms on which you maintain an online presence. If you are a central New Jersey business or organization and need help with your video sharing on social media, get in touch with us here at TeeFour Productions. We can help you to create a great video, and also help you maximize your exposure through smart use of social media technologies.